During the interaction between rhizobia and leguminous plants the two partners engage in a molecular conversation that leads to reciprocal recognition and ensures the beginning of a successful symbiotic integration. In host plants, intracellular Ca2+ changes are an integral part of the signalling mechanism. In rhizobia it is not yet known whether Ca2+ can act as a transducer of symbiotic signals. A plasmid encoding the bioluminescent Ca2+ probe aequorin was introduced into Mesorhizobium loti USDA 3147T strain to investigate whether a Ca2+ response is activated in rhizobia upon perception of plant root exudates. We find that M. loti cells respond to environmental and symbiotic cues through transient elevations in intracellular free Ca2+ concentration. Only root exudates from the homologous host Lotus japonicus induce Ca2+ signalling and downstream activation of nodulation genes. 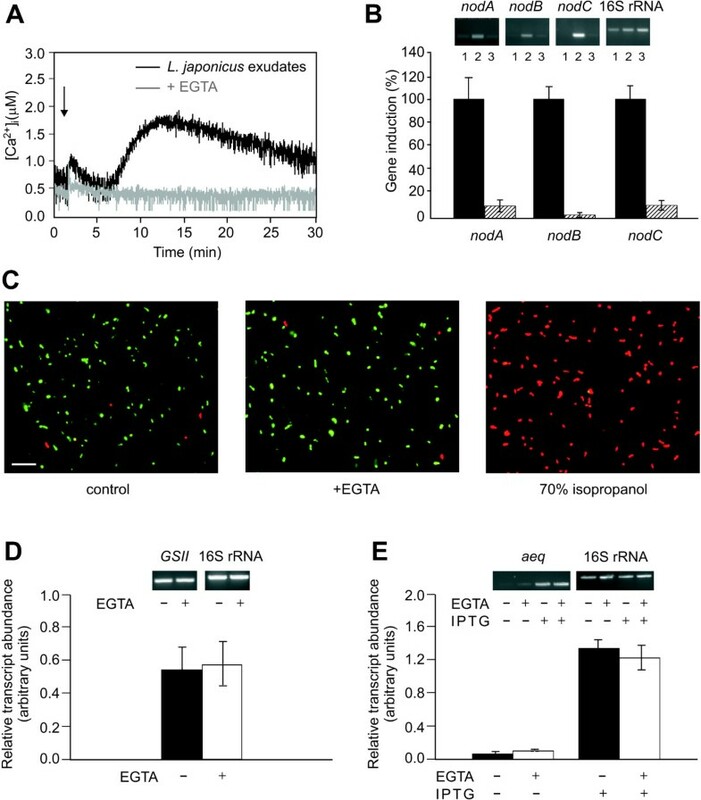 The extracellular Ca2+ chelator EGTA inhibits both transient intracellular Ca2+ increase and inducible nod gene expression, while not affecting the expression of other genes, either constitutively expressed or inducible. These findings indicate a newly described early event in the molecular dialogue between plants and rhizobia and highlight the use of aequorin-expressing bacterial strains as a promising novel approach for research in legume symbiosis. Rhizobia are Gram-negative soil bacteria which can engage in a mutualistic association with leguminous plants. Under nitrogen-limiting conditions, rhizobia colonize plant roots and highly specialized plant organs, the nodules, are generated de novo on host roots (for a recent review see ). When living symbiotically, rhizobia are able to fix atmospheric nitrogen into forms usable by the plant. In return, they receive dicarboxylic acids as a carbon and energy source for their metabolism. Nitrogen is the most frequent limiting macronutrient in many soils, and it is generally supplied as fertilizer. The rhizobium-legume mutualistic association can reduce or eliminate nitrogen fertilizer requirements, resulting also in a benefit to the environment . A successful symbiosis is the result of an elaborate developmental program, regulated by the exchange of molecular signals between the two partners . During growth in the rhizosphere of the host plant, rhizobia sense compounds secreted by the host root and respond by inducing bacterial nodulation (nod) genes which are required for the synthesis of rhizobial signal molecules of lipo-chitooligosaccharide nature, the Nod factors. In the host plant, the generation of intracellular Ca2+ oscillations triggered by Nod factors has been firmly established as one of the earliest crucial events in symbiosis signalling; these oscillations are transduced into downstream physiological and developmental responses . It is not known whether there is a parallel key role for Ca2+ in rhizobia. As in eukaryotic cells, Ca2+ is postulated to play essential functions in the regulation of a number of cellular processes in bacteria, including the cell cycle, differentiation, chemotaxis and pathogenicity [4, 5]. Homeostatic machinery that is able to regulate intracellular free Ca2+ concentration ([Ca2+]i) tightly is a prerequisite for a Ca2+-based signalling system, and is known to be present in bacteria . Ca2+ transport systems have been demonstrated in bacteria, with the identification of primary pumps and secondary exchangers, as well as putative Ca2+-permeable channels [5, 7]. Other Ca2+ regulatory components such as Ca2+-binding proteins, including several EF-hand proteins, have been detected and have been putatively identified from genomic sequences [8, 9]. In order to establish precisely when and how Ca2+ regulates processes in bacteria it is essential to measure [Ca2+]i and its changes in live cells. This has proven difficult because of problems in loading fluorescent Ca2+ indicator dyes, such as fura-2, into bacterial cells. However, the recombinant expression of the Ca2+-sensitive photoprotein aequorin, which has been demonstrated to be a suitable method to monitor [Ca2+]i changes accurately in eukaryotes [10–12], has been successfully applied also to bacteria. Challenge of E.coli [13–17] and the cyanobacterium Anabaena sp. PCC7120 [18–21] expressing aequorin with different stimuli resulted in the induction of transient variations of [Ca2+ ]i with specific Ca2+ signatures. Here we report the introduction of a plasmid encoding apoaequorin in Mesorhizobium loti, the specific symbiont of the model legume Lotus japonicus, and the use of this reporter to examine the Ca2+ response of rhizobia to abiotic and biotic stimuli. The results obtained highlight the occurrence in M. loti of Ca2+-based mechanisms for sensing and responding to cues originating in the rhizosphere. The apoaequorin gene was cloned in the broad host-range expression vector pDB1  under the control of the strong synthetic promoter Psyn, regulated by the lacIq repressor (see Additional file 1). The pAEQ80 plasmid was mobilized by conjugation into the type strain of M. loti (USDA 3147T). The functioning in M. loti of the pAEQ80 plasmid containing the apoaequorin gene was verified by evaluating the level of aequorin expression in an in vitro reconstitution assay. Light emitted by total soluble protein contained in the lysates from wild-type and aequorin-expressing M. loti cells was monitored after reconstitution of the apoprotein with coelenterazine. The strong luminescence signal detected in protein extracts from M. loti cells containing the apoaequorin construct and induced with IPTG confirmed the efficient level of aequorin expression (see Additional file 2). We analysed whether the introduced pAEQ80 plasmid (10.5 kb) encoding apoaequorin or the expressed protein could affect bacterial cell growth and the symbiotic performance of M. loti cells. There is no significant effect on bacterial growth kinetics exerted either by the introduced plasmid or apoaequorin expression. Nodulation efficiency of M. loti pAEQ80 cells on the specific plant host Lotus japonicus was checked 4 weeks after bacterial inoculation on roots of seedlings grown on nitrogen-free medium. L. japonicus roots were found to be effectively nodulated by the transformed bacterial strain, with no differences in nodule number (5 ± 1) and morphological parameters in comparison to seedlings inoculated with wild-type M. loti. The presence of bacteria inside nodules was verified by light microscopy (see Additional file 2). Green foliage was indicative of functional symbiosis. The occurrence in M. loti cells of homeostatic control of the internal Ca2+ activity was then verified by preliminary Ca2+ measurement assays in a luminometer after in vivo reconstitution of apoaequorin. Unperturbed exponentially growing rhizobial cells showed a steady-state intracellular free Ca2+ concentration ([Ca2+]i) residing in the submicromolar range (around 500 nM) (see Additional file 2), demonstrating a tight regulation of [Ca2+]i. No luminescence was detected either in cultures of the non-recombinant strain incubated with coelenterazine or in recombinant cells that had not been exposed to coelenterazine (data not shown), confirming that the recorded signal was due only to Ca2+-dependent light emission from aequorin. To further validate the experimental system, abiotic stimuli which are known to trigger [Ca2+]i changes in both plants  and cyanobacteria [18, 19] were applied to apoaequorin-expressing M. loti cells. A mechanical perturbation, simulated by the injection of isoosmotic cell culture medium, resulted in a rapid Ca2+ transient increase (1.08 ± 0.24 μM) that decayed within 30 sec (Fig. 1A). This Ca2+ trace, which is frequently referred to as a "touch response", is often observed after the hand-operated injection of any stimulus . 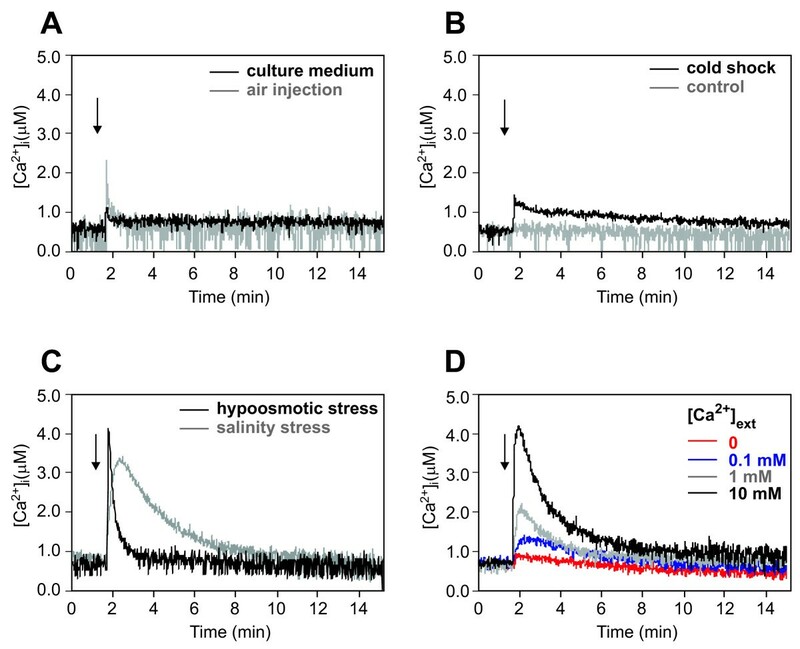 A similar Ca2+ response characterized by an enhanced Ca2+ peak of 2.14 ± 0.46 μM was triggered by a simple injection of air into the cell suspension with a needle (Fig. 1A). Ca 2+ measurements in M. loti cells stimulated with different physico-chemical signals. Bacteria were challenged (arrow) with: A, mechanical perturbation, represented by injection of an equal volume of culture medium (black trace) or 10 volumes of air (grey trace); B, cold shock, given by 3 volumes of ice-cold culture medium (black trace); control cells were stimulated with 3 volumes of growth medium kept at room temperature (grey trace); C, hypoosmotic stress, given by injection of 3 volumes of distilled water (black trace); salinity stress, represented by 200 mM NaCl (grey trace); D, different external Ca2+ concentrations. These and the following traces have been chosen to best represent the average results of at least three independent experiments. Cold and hypoosmotic shocks, caused by supplying three volumes of ice-cold medium and distilled water, respectively, induced Ca2+ traces with distinct kinetics, e.g. different height of the Ca2+ peak (1.36 ± 0.13 μM and 4.41 ± 0.51 μM, respectively) and rate of dissipation of the Ca2+ signal (Fig. 1B and 1C). As a control, cells were stimulated with three volumes of growth medium at room temperature, (Fig. 1B) resulting in a Ca2+ trace superimposable on that of the touch response (Fig. 1A). These findings eliminate the possible effect of bacterial dilution on changes in Ca2+ homeostasis. Challenge of M. loti with a salinity stress, which has recently been shown to affect symbiosis-related events in Rhizobium tropici , resulted in a [Ca2+]i elevation of large amplitude (3.36 ± 0.24 μM) and a specific signature (Fig. 1C). Variations in the extracellular Ca2+ concentration determined the induction of transient Ca2+ elevations whose magnitude was dependent on the level of external Ca2+. After a rapidly induced increase in [Ca2+]i, the basal Ca2+ level was gradually restored with all the applied external Ca2+ concentrations (Fig. 1D), confirming a tight internal homeostatic Ca2+ control, as previously shown for other bacteria [14, 18]. All the above results indicate that aequorin-expressing M. loti cells comprise a functionally valid system with which to investigate the involvement of Ca2+ in intracellular transduction of environmental stimuli. Root exudates from the symbiotically compatible legume L. japonicus were collected from 3-week-old seedlings axenically grown in water and applied to M. loti cells. The dose used for Ca2+ measurements was in the range that induced significant expression of nodA, nodB, nodC genes in M. loti (Fig. 2A). This concentration was found to trigger a transient [Ca2+]i change characterized by a very rapid increase (1.38 ± 0.23 μM Ca2+) followed by a second sustained major Ca2+ peak (2.01 ± 0.24 μM) at about 10 min (Fig. 2B), with a slow decay within the considered time interval (30 min). The observed induction of transient [Ca2+]i changes in M. loti cells suggests a Ca2+-mediated perception of signalling molecules contained in host plant root exudates. Effect of plant root exudates and tetronic acid on [Ca 2+ ] i and nod gene expression in M. loti. A, Analysis of gene expression by semi-quantitative RT-PCR during control conditions (lane 1, white bars) and after 1 h treatment with L. japonicus root exudates (lane 2, black bars) or 1.5 mM tetronic acid (lane 2, striped bars). Relative transcript abundance was normalized against 16S rRNA. Data are the means ± SEM of three independent experiments. B, Monitoring of [Ca2+]i changes in M. loti cells challenged (arrow) with L. japonicus root exudates (black trace) or 1.5 mM tetronic acid (grey trace). Flavonoids are components of root exudates that play a prominent role as inducers of structural nod genes in rhizobia. Although flavonoids have been detected in L. japonicus seeds , those that specifically activate the expression of nod genes in M. loti have not yet been identified [27, 28]. The most common flavonoids, known as nod gene inducers in other rhizobia (10 μM naringenin, luteolin, daidzein, kaempferol, quercetin dehydrate) were not able to trigger transient Ca2+ elevations in M. loti (data not shown). Tetronic acid, an aldonic acid previously reported to promote Nod factor biosynthesis in M. loti , was found to induce a detectable Ca2+ response (Fig. 2B). The kinetics of the Ca2+ trace was similar to that induced by crude root exudates, with a prompt Ca2+ spike (1.36 ± 0.16 μM Ca2+) and a subsequent flattened dome (maximal Ca2+ value of 1.29 ± 0.08 μM reached around 15 min after the elicitor application). 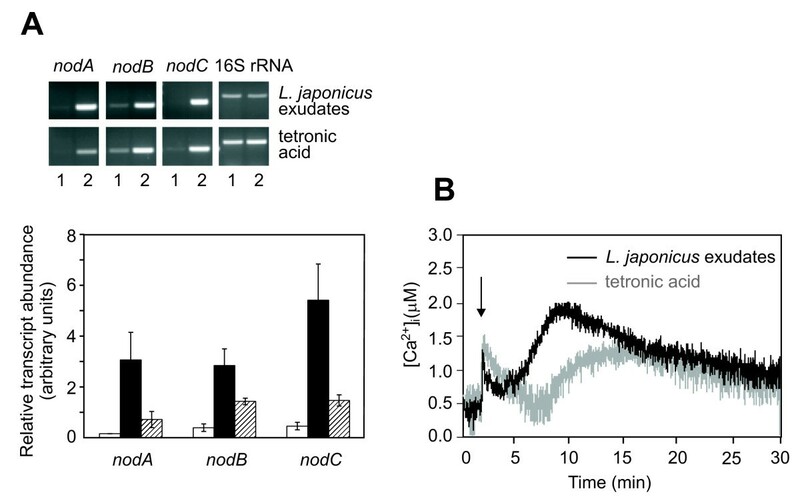 Notably, this second phase of the Ca2+ transient induced by tetronic acid only partially accounted for the larger Ca2+ increase recorded with the whole L. japonicus root exudates (Fig. 2B). Likewise, the level of nod gene expression induced by tetronic acid was found to be lower (though significantly different from the control, P < 0.05) than that generated by total root exudates (Fig. 2A). Pretreatment of rhizobial cells with the extracellular Ca2+ chelator EGTA for 10 min effectively inhibited both the transient Ca2+ elevation (Fig. 3A) and nod gene activation (Fig. 3B) induced by L. japonicus root exudates. This indicates that the main source of the observed Ca2+ response is the extracellular medium, and that the elevation in [Ca2+]i is required for nod gene induction. Cell viability, monitored by the BacLight Bacterial viability assay, was not altered by incubation with the Ca2+ chelator (Fig. 3C). The expression of both constitutive (glutamine synthetase II and 16S rRNA) and inducible (aequorin) genes was not significantly affected by EGTA treatment (Fig. 3D and 3E), ruling out possible general effects of extracellular Ca2+ chelation on gene induction. Effect of EGTA on the Ca 2+ response and nod gene expression induced by L. japonicus exudates. A, M. loti cells were treated with L. japonicus root exudates (black trace) or pretreated with 5 mM EGTA 10 min before adding L. japonicus root exudates (grey trace). B, Top: RT-PCR analysis of control cells (lane 1), cells treated for 1 h with L. japonicus root exudates (lane 2) and cells pretreated with 5 mM EGTA 10 min before treatment with L. japonicus exudates (lane 3). Bottom: Relative percentage of nod gene induction in response to L. japonicus exudates in M. loti cells pretreated (striped bars) or not (black bars) with 5 mM EGTA. Normalization of transcript abundance was done against 16S rRNA. Data are the means ± SEM of three independent experiments. C, Viability, monitored with the BacLight Bacterial Viability kit, of M. loti cells in control conditions or incubated with 5 mM EGTA for 1 h 10 min. As positive control, cells were treated with 70% isopropanol. Live cells fluoresce green, dead cells fluoresce red. Bar = 10 μm. D, Top: RT-PCR analysis of the expression of the housekeeping gene glutamine synthetase II (GSII) in M. loti cells in the absence (-) or presence (+) of 5 mM EGTA. Bottom: Relative transcript abundance of GSII was normalized against 16S rRNA. Bars represent SEM. E, Top: RT-PCR analysis of the inducible aequorin (aeq) gene in M. loti cells in the absence (-) or presence (+) of 5 mM EGTA and 1 mM IPTG. Bottom: Relative transcript abundance of aeq was normalized against 16S rRNA. Bars represent SEM. To check host specificity of the Ca2+ signal, metabolite mixtures exuded by the non-host legumes soybean and Vicia sativa subsp. nigra were tested. After an initial rapid and steep Ca2+ rise (1.77 ± 0.34 μM), shared also by the response to L. japonicus root exudates, the Ca2+ transients triggered by non-host exudates show very different kinetics, such as a slow rate of decay of the Ca2+ level (Fig. 4A versus Fig. 2B). Pretreatment with EGTA also blocked these transient Ca2+ elevations (data not shown). The distinct Ca2+ signature activated by non-host legumes, together with the lack of activation of nod genes (Fig. 4B), suggests the possibility of Ca2+-mediated perception by M. loti of molecules other than nod gene inducers, such as non-specific chemoattractants or other signalling molecules, e.g. proteins [30, 31] or plant cell wall fragments released during the detachment of border cells from the root tip , activating a different Ca2+ signalling pathway. Further confirmation of the specificity of the host plant-induced Ca2+ signalling comes from the complete absence of any detectable Ca2+ change and nod gene transcriptional activation by root exudates from a non-legume (tomato) (Fig. 4A and 4B). Monitoring [Ca 2+ ] i and nod gene expression in response to non-host legume and non-legume root exudates. Bacteria were challenged with root exudates from soybean (A, black trace; B, lane 2), V. sativa subsp. nigra (A, grey trace; B, lane 2) and tomato (A, light grey trace; B, lane 2). Control cells were treated with cell culture medium only (B, lane 1). Even though Ca2+-based signal transduction processes are well-established to underpin plant cell responses to rhizobial informational molecules, a possible involvement of Ca2+ as a messenger in rhizobia in response to plant symbiotic signals has not hitherto been considered. We approached this issue by constructing a M. loti strainexpressing the bioluminescent Ca2+ indicator aequorin. The highly sensitive and reliable aequorin-based method is widely used to monitor the dynamic changes of [Ca2+]i in both eukaryotic  and bacterial [18, 16] living cells and represents to date the tool of choice for monitoring Ca2+ changes in cell populations . The effectiveness of this recombinant technique has been verified at more than one level, and the results obtained demonstrate the utility of aequorin as a probe to study the early recognition events in rhizobium-legume interactions from the bacterial perspective. The generation of a well-defined and reproducible Ca2+ transient in M. loti cells in response to root exudates of the host plant L. japonicus containing nod gene inducers is indicative of Ca2+ participation in sensing and transducing diffusible host-specific signals. It cannot be ruled out that the biphasic pattern of the Ca2+ trace (Fig. 2B), monitored by the aequorin method, may be due to an instantaneous synchronized Ca2+ increase in cells immediately after stimulation, followed by a sustained Ca2+ response probably due to the sum of asynchronous oscillations occurring in single cells. Ca2+ oscillations, considered as a universal mode of signalling in eukaryotic cells [34–36] have been proposed to occur in bacteria as well . The significant inhibition of nod gene expression obtained when the Ca2+ elevation is blocked indicates that an upstream Ca2+ signal is required for nod gene activation. The Ca2+ dependence of nod gene expression strongly suggests that the [Ca2+]i change, evoked by L. japonicus exudates, represents an essential prerequisite to convey the plant symbiotic message into rhizobia. All the above results fulfil the criteria required to demonstrate that a Ca2+ transient is a crucial intermediate in a stimulus-response coupling  and confirm that Ca2+ signalling is operating in bacteria . The inability of root exudates from non-host legumes and non legumes to duplicate the response induced by L. japonicus exudates (encoded in a distinct Ca2+ transient and downstream gene expression) further supports the symbiotic specificity of the host legume-induced Ca2+ signature. The possible relatedness to legume-rhizobium symbiosis of the signals contained in non-host legume exudates is supported by the absence of any Ca2+ response to non-legume exudates. In non-host legume root exudates M. loti cells may sense signalling molecules related to the symbiotic process but not strictly specific to the compatible host-microsymbiont pair, which may enable rhizobia to distinguish non-host from compatible plants. Plant root exudates contain a pool of molecules, both stimulatory and inhibitory, of potential relevance to the molecular signal exchange between the two partners . The use of entire natural mixtures secreted by plant roots represents the first step in the evaluation of rhizobium reactions to plant factors, providing information on the global Ca2+ responses occurring in the bacterial partner early in the symbiosis, even before a physical contact between the two interacting organisms. Further insights into the dynamics of the activated Ca2+ change may come from the comparison with the Ca2+ responses obtained by using fractionated root exudates or purified molecules. This would enable to assess the possible placement of the Ca2+ signal within the NodD-flavonoid gene expression paradigm  in different species of rhizobia. The above results demonstrate that M. loti cells sense host plant symbiotic cues through Ca2+ and indicate that activation of nod genes requires an upstream Ca2+ signal. Transgenic rhizobium strains expressing aequorin can be used as a novel approach to the dissection of early events in legume-rhizobium symbiosis, that may shed light on a previously uninvestigated facet - bacterial Ca2+ signalling - of the two-way partner signal exchange and transduction. Native coelenterazine was purchased from Molecular Probes (Leiden, The Netherlands). Molecular biology reagents were purchased from Promega Co. (Madison, WI, USA), Qiagen (Hilden, Germany) Clontech (Mountain View, CA, USA) and Invitrogen (Paisley, UK). Tetronic acid was obtained from Titolchimica (Rovigo, Italy). Flavonoids (naringenin, luteolin, daidzein, quercetin dehydrate) and all other reagents were obtained from Sigma-Aldrich (St. Louis, MO, USA). Mesorhizobium loti strain USDA 3147T was kindly provided by Peter Van Berkum (USDA, Beltsville MD) and was grown in minimal BIII medium  with or without 30 μg/ml kanamycin, as appropriate, at 28°C with shaking (170 rpm). E. coli was grown in LB medium at 37°C. The terms aequorin and apoaequorin refer to the bioluminescent protein with and without, respectively, the prostethic group coelenterazine. The apoaequorin cassette, given by the apoaequorin cDNA fused to the first 27 nucleotides encoding hemoagglutinin (HA1-AEQ)  was amplified by PCR with primers designed to obtain a 5' XbaI site and to leave out the ATG start codon, already present into the Psyn promoter of the expression vector pDB1 . The correct translation frame was maintained by adding a nucleotide between the 5' XbaI site and the apoaequorin gene. The primers used to obtain the apoaequorin cassette were: 5'-CCTACTCTAGATAAGCTTTATGATGTTCCT-3'and 5'TGATAGCATGCGAATTCATCAGTGTTTTAT-3'. PCR was run with the following parameters: 5 min at 94°C as start step; 30 s at 94°C, 30 s at 58°C, 1 s at 72°C for 30 cycle and 5 s at 72°C as a final step using PLATINUM® Taq DNA polymerase (Invitrogen). To obtain a 3' XbaI site, the amplicon was then cloned into the pCR 2.1 plasmid by using TA Cloning® technology (Invitrogen), originating p2.1AEQ. Digestion with XbaI of this intermediate plasmid released the HA1-AEQ coding region, which was then ligated into the XbaI site of pDB1 under the control of the strong isopropylβ-D-thiogalactoside (IPTG)-inducible synthetic promoter Psyn. The apoaequorin gene containing construct (pAEQ80, see Additional file 1) was mobilized to M. loti 3147T from E. coli by triparental conjugation using plasmid pRK2013 as helper . Transconjugants were selected on BIII agar containing 50 μg/ml kanamycin. To determine the effect of the plasmid presence and of apoaequorin expression on bacterial cell growth, M. loti wild-type or containing pAEQ80 (plus or minus IPTG) were grown in 30 ml of BIII medium (supplemented or not with 30 μg/ml kanamycin, as appropriate) as described above. Growth was determined by monitoring turbidity at 600 nm. In vitro nodulation studies were carried out as described by . Briefly, seeds of L. japonicus B-129 GIFU were transferred after sterilization on 0.1% Jensen medium solidified with 1% agar. Inoculation with bacterial suspensions of M. loti wild-type or containing pAEQ80 (5·107 cells/root) was carried out 4 days after seed germination. Lotus seedlings, before and after infection, were grown at 24°C with 16 h light and 8 h dark. Growth and nodulation pattern were monitored for 4 weeks after inoculation. Microscopy observations were carried out with a Leica MZ16 stereomicroscope equipped with a DFC 480 photocamera. To check the actual occurrence of bacteria inside the nodules, they were squeezed and the content stained with 5 μg/ml 4',6-diamino-2-phenylindole (DAPI). Samples were observed with a Leica DMR fluorescence microscope. Images were acquired with a Leica IM500 digital camera. A loopful of M. loti USDA 3147T pAEQ80 grown on BIII plates was used to inoculate 30 ml of BIII medium supplemented with 30 μg/ml kanamycin and 1 mM IPTG and grown at 28°C overnight, until an absorbance at 600 nm of approximately 0.25 was reached (after about 18 h). M. loti suspension cultures (300 ml) were grown to mid-exponential phase (A600 nm = 0.25), pelletted by centrifugation at 3000 g for 10 min at 4°C, washed twice with fresh medium, and finally resuspended in 2 ml reconstitution buffer (Tris-HCl 150 mM, EGTA 4 mM, supplemented with 0.8 mM phenylmethylsulfonyl fluoride, pH 8.0). Bacteria were lysed by 3 cycles (30 s each) of sonication at 35 Hz (Fisher Sonic, Artek Farmingdale, NY, USA), each followed by 30 s on ice. Non lysed bacteria were pelletted and discarded by centrifugation (1600 g for 15 min at 4°C). Protein concentration in the supernatant was estimated using the Bio-Rad (Hercules, CA) protein assay according to manufacturer's instructions. Total soluble proteins were resuspended at 1 μg/μl in reconstitution buffer and incubated with 1 mM β-mercaptoethanol and 5 μM coelenterazine for 4 h in the dark at 4°C. Aequorin luminescence was detected from 50 μl of the in vitro aequorin reconstitution mixture, containing 25 μg of total soluble protein diluted 1:2 with the same buffer and integrated for a 200 s time interval after the addition of an equal volume of 100 mM CaCl2. Mid-exponential phase cells (30 ml) were harvested by centrifugation at 2300 g for 15 min at room temperature and the cell pellet was washed twice in 5 ml BIII medium with intermediate centrifugation as described above. Cells were then incubated in BIII medium containing 5 μM coelenterazine in the dark for 1 h 30 min under shaking. After two washes as above, cells were resuspended in BIII medium and allowed to recover for 10 min prior to Ca2+ measurement experiments. Seeds of Lotus japonicus GIFU ecotype, soybean, Vicia sativa subsp. nigra and tomato were surface sterilized and allowed to germinate for three days on moistened filter paper at 24°C in the dark. Subsequently, seedlings were transferred aseptically on polystyrene grids covered with nylon meshes in sterile plastic containers containing different volumes of sterile H2O, depending on the seed and seedling size (on average 5 ml of H2O per seedling). After 3 weeks of germination crude root exudates were collected, filtered and lyophilized. The pellet was resuspended in BIII medium (50 μl per single root exudate) for cell treatments. Aequorin light emission was measured in a purpose-built luminometer. Bacteria (50 μl) were placed, after aequorin reconstitution, in the luminometer chamber in close proximity to a low-noise photomultiplier, with a built-in amplifier discriminator. The output of the discriminator was captured by a THORN-EMI photon counting board (Electron Tubes Limited, Middlesex, UK) and the luminescence data were converted off-line into Ca2+ concentration values by using a computer algorithm based on the Ca2+ response curve of aequorin . All stimuli were administered to cells by using a light-tight syringe through the luminometer port. The experiments were terminated by lysing the cells with 15% ethanol in a Ca2+-rich solution (0.5 M CaCl2 in H2O) to discharge the remaining aequorin pool. For experiments performed in the presence of different external Ca2+ concentrations, cells were extensively washed and resuspended in buffer A (25 mM Hepes, 125 mM NaCl, 1 mM MgCl2, pH 7.5), as described by . When needed, cells were pretreated for 10 min with 5 mM EGTA. Bacterial cell viability was monitored by the LIVE/DEAD® BacLight™ Bacterial Viability kit (Molecular Probes), according to manufacturer's instructions. This fluorescence-based assay use a mixture of SYTO 9 and propidium iodide stains to distinguish live and dead bacteria. Bacteria with intact cell membranes stain fluorescent green, whereas bacteria with damaged membranes stain fluorescent red. Samples were observed with a Leica 5000B fluorescence microscope. Images were acquired with a Leica 300F digital camera using the Leica Application Suite (LAS) software. M. loti cells grown to mid-exponential phase and treated as for Ca2+ measurement experiments (see above) were incubated for 1 h with plant root exudates, tetronic acid or cell culture medium only (as control). To stabilize RNA, bacteria were treated with the RNA protect Bacteria Reagent (Qiagen). Bacterial cell wall was then lysed with 1 μg/ml lysozyme (Sigma) in TE buffer. Total RNA was first extracted using RNeasy Mini kit (Qiagen) and, after DNAse I treatment (Promega), quantified. RNA (5 μg) was primed with Random Decamers (Ambion), reverse transcribed with PowerScript Reverse Transcriptase (Clontech) and diluted 1:5. 5 μl of diluted first-strand cDNA were used as a template in a 50 μl PCR reaction solution. Reverse transcription (RT)-PCR was performed with 5 μl diluted first-strand cDNA. The oligonucleotide primers were designed against nodA, nodB, nodC and glutamine synthetase II (GSII) sequences from M. loti  and the aequorin gene (aeq) from Aequorea victoria , using Primer 3 software. To amplify 16S rRNA gene, Y1 and Y2 primers were used . 5'-ATACGGATGAGCGTTGGTTCGTTTT-3'for aequorin, Y1 (5'-TGGCTCAGAACGAACGCTGGCGGC-3') and Y2 (5'-CCCACTGCTGCCTCCCGTAGGAGT-3') for 16S rRNA. Amplicons were sequenced by BMR Genomics (Padova, Italy). This work was supported by Progetti di Ricerca di Ateneo 2006 from the University of Padova (prot. CPDA063434) and Ricerca Scientifica fondi quota EX 60% 2007-2009 (prot. 60A06-9994/07, 921/08 and 5430/09) to L.N. We are grateful to M. Brini (Padova, Italy) for kindly providing the apoaequorin cassette and for helpful discussion on Ca2+ measurement experiments, and to D. Sanders (York, UK) for critical reading of the manuscript and insightful comments. We also thank J. Stougaard (Aarhus, Denmark), S. Varotto (Padova, Italy) and Vergerio Mangimi S.R.L. (Padova, Italy) for the kind gift of L. japonicus, soybean and V. sativa seeds, respectively. RM cloned the apoaequorin gene, carried out the RT-PCR experiments and participated in the Ca2+ measurement experiments. SA and AS introduced the apoaequorin gene into E. coli and M. loti. LN performed the nodulation studies, prepared the plant root exudates and was involved in acquisition and interpretation of Ca2+ measurement data. MP and LN conceived of the study, designed the experiments and wrote the paper. AS helped with manuscript discussion and participated in its editing. All authors read and approved the final manuscript.